Who loves wildlife-spotting while travelling? We DO! So you can imagine what an incredible time we had when we were in the Galapagos. We cannot believe that it has been 4 years since we visited there. We so fondly remember our time exploring three of the islands! Without further a do… introducing the different wildlife we were able to meet. Friendly, curious and relaxed, you can spot these gorgeous fellows everywhere. They really know how to sunbathe. We were lucky to see so many pups. We loved how uninhibited and playful they were. These guys are very unique and probably the ones we found most fascinating to learn about. They are typical reptiles, basking in the early morning sun. Then later in the day, they will dive for seaweed growing on the sea floor. They are the only true marine lizards and live only in the Galapagos. 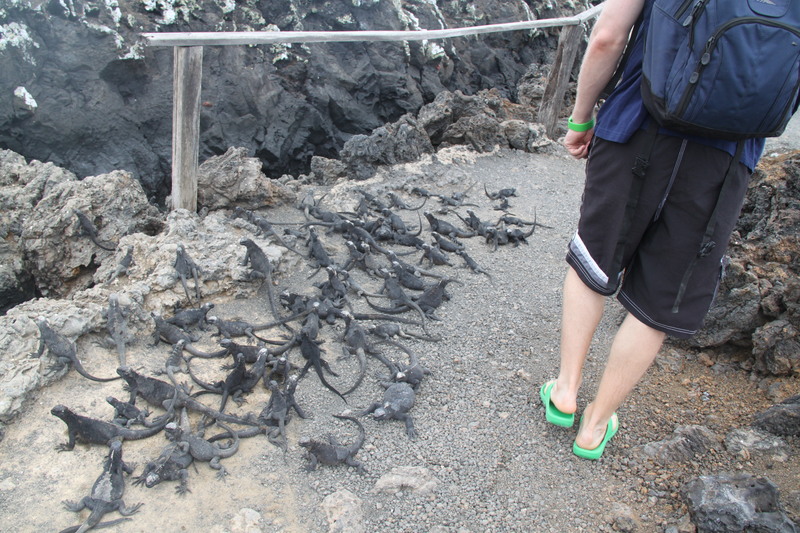 They are everywhere, so if you go, watch out where you put your foot, as they camouflage with the volcanic rock sometimes. How many can you see in this picture? There once were 14 recognisable species of giant tortoises on the Galapagos Islands. Over the years, they have been killed for many things by humans, including for food. The species count is officially down to 10 because when we were there, there were still 11. 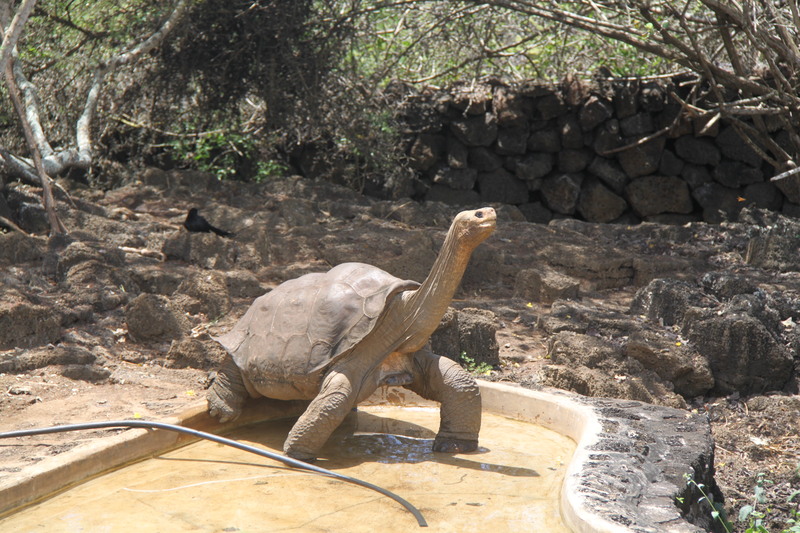 With Lonesome George (pictured below) being the last of his kind, we felt very humbled to have met him before he passed away the year after we met him. It was estimated that he was over a hundred years old. Trivia: As a tortoise gets older, the lines on his shell become fewer. Works opposite to a tree trunk. Now to the folks found predominantly in the water…. Not easy to see it in the photo, but it’s coming up for air. We had to crop and zoom this photo a little so the octopus could be seen…. can you see it? We found the manta ray and spotted rayfish in a lagoon and not in the open waters. We were sitting on a jetty one lazy afternoon and looked down and what do we see swim past but these two. 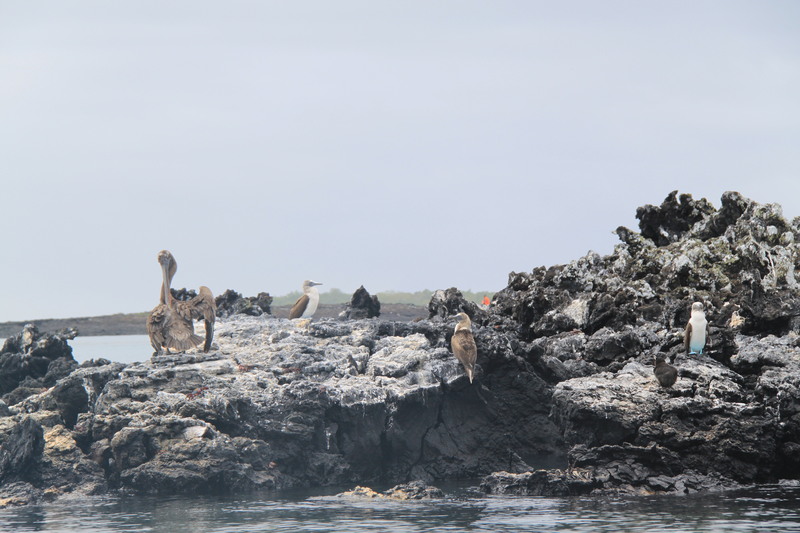 There are so many different species of birds in the Galapagos. These were the ones we were fortunate to see and snap a photo of. They are huge just sitting there. Watching them in the air is simply unreal. There look enormous when you see their wingspan in flight. Interesting name… but there are plenty of boobies to see in the Galapagos. These blue-footed ones are easy to spot thanks to their bright blue feet. When they are in their mating prime, their feet are the bright blue.. it fades when it’s not time. Just for a bit of fun, can you spot the four different species of bird in this photo? Disclaimer: We apologise if we have named any of the animals incorrectly, this is us digging into our memory bank 🙂 If you spot any errors, please let us know. Up until NOW, we hadn’t really appreciated the extent of all the wildlife we encountered on this trip. Where would you recommend we go to do some more wildlife spotting? This entry was posted in Galapagos Islands and tagged animals, birds, blue-footed boobies, frigatebird, Galapagos Islands, giant tortoises, great blue heron, Lonesome George, marine iguanas, Photography, sea lion, the Galapagos, Travel, travel photography, Wildlife, wildlife photography. The Weekly Photo Challenge asked us what we treasure…. We treasure each other and our families of course. But for this challenge, we are showing another thing we treasure: the world around us. The one experience that we both hold dear is when we were able see Lonesome George in his last months on earth. 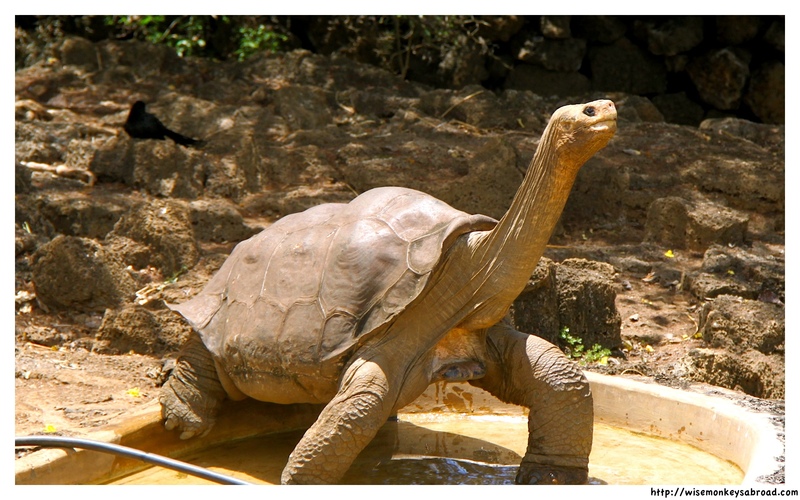 Lonesome George was the last of the Pinta Island tortoises and is the Galapagos Island conservation icon. He represents to us how precious and vulnerable nature is and how much we need to treasure it! This entry was posted in Galapagos Islands, Photo Challenges, South America, Weekly Photo Challenges and tagged animals, Charles Darwin, conservation, environment, extinct, Galapagos, Galapagos Islands, giant tortoises, Lonesome George, nature, Photograph, Photography, sustainability, theory of evolution, tortoise, Weekly Photo Challenge. We all are aware of Darwin’s theory of evolution. It is from his time spent in the Galapagos Islands that helped him arrive at this theory. However this isn’t about his theory, its about the animals behind his theory. There are two ways one can get around the Galapagos Islands. The first is to take a cruise (which is the popular way) after flying in from Quito and the second is to island hop. We chose the latter and after speaking to the locals, this is their preference too. Island hopping allows the money from tourism to be pumped back into the islands and its people as opposed to cruises where the money returns to the cruise companies. The examples that were given to us by one of our guides was that if tourists chose to island hop, they would eat on the island and sleep on shore therefore a cascade of benefits would follow (in terms of employment for the locals and economy boost). Anyway, economy aside and how ever the Galapagos Islands are explored, there is no doubting that it is a wonderland of fauna and flora. There were many occasions where we would see several species of birds perched together (diversity). Or other occasions where we saw numerous animals of the same species (abundance). And probably the sweetest thing is getting up close with the animals. Obviously there are rules about touching them and staying a certain distance away from them but when we were with the guides, we went off their cues. There were times when we had sea lions frolicking in the water beside our boat, marine iguanas scurrying past us and blue-footed boobies happily perched on rocks a mere metre away without even blinking an eyelid at us. With all the wildlife and wonderful encounters also comes with the need for conservation. The conservation messages are reinforced and there is a big drive to preserve the environment for us and for the animals. For us, seeing Lonesome George, the last of his species was a humbling experience. To think that there once were 14 species of tortoises in the Galapagos and now only 11, and being on the verge of down to 10. The Galapagos is a place worth visiting to remind us of how animals and humans can live in harmony and how important it is to look after the planet for future generations to enjoy! This entry was posted in Galapagos Islands and tagged Blue-footed Booby, Darwinism, environment, fauna, Galapagos, Galápagos Islands, giant tortoises, marine iguana. So many little nooks and crannies around The Rocks in #Sydney - we walked down these stairs the other night and couldn’t help but think of all those before us that would’ve come down those very same stairs too. And imagine the stories they could tell especially back in the 19th Century. #People watching as the ferries come and go in #Sydney Harbour! Sometimes we get bored of home but lately we’ve been so in love with it!! We love it when we check out #tourist hotspots around #Sydney that aren’t overrated! Looking at our home city from a different perspective on this gorgeous and clear day. Wise Monkeys Abroad by Wise Monkeys Abroad is licensed under a Creative Commons Attribution-NonCommercial-NoDerivatives 4.0 International License. Based on a work at http://wisemonkeysabroad.com.